At St. Monica Catholic High School, technology is an integral part of the teaching and learning process, supporting and transforming individual student learning at all levels. As a result, St. Monica graduates are empowered with skills and knowledge for success and act with integrity to create a better world. 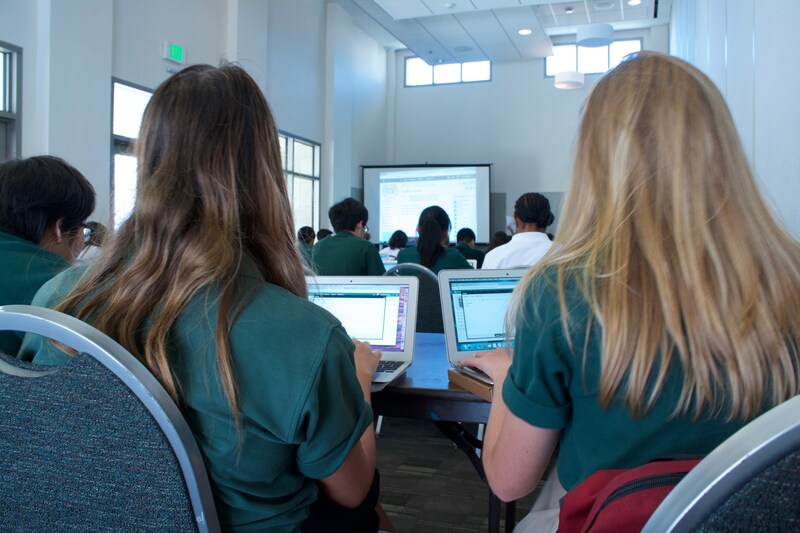 St. Monica Catholic High School launched a 1:1 laptop program in 2011 to allow for teachers and students to transform the education being provided to students at St. Monica. As part of this program, all students receive an Apple MacBook Air computer utilized in the classroom and at home. Support technology integration throughout the curriculum with Google Apps for Education. Support learning and communication beyond the classroom walls with Schoology. Personalize math instruction through adaptive technology with Think Through Math. Improve writing and research skills with Turnitin.com. Foster creative and innovative thinking with AP Computer Science Principles and Media & Film Production courses.